Solvalla, Sweden–After taking the second heat over Maven, Magic Tonight (Andover Hall), trained by Roger Walmann and driven by Örjan Kihlström, won The Elitlopp final at Solvalla racetrack in Sweden on Sunday. From p ost one, he grabbed the early lead and won by a head, earning $350,000. The time was 1.52.4. Maven was unplaced in the final. The six-year-old was bred in America by Marvin Katz and Al Libfeld and sold as a yearling at the 2010 Lexington Selected Sale for $55,000. Mosaique Face was second, and Nuncio, three wide throughout, finished third. The finish was a tight one, with perhaps three lengths from first to last. The other American hopeful, Wind of the North, raced in third on the outside in his elimination, finishing fifth and thereby didn’t reach the final. Winner Magic Tonight came from the U.S. to trainer Roger Walmann two years ago. He was a candidate for The Elitlopp last year but Walmann felt it too early to race there with a 5-year old Magic Tonight. After this race, he was pleased with that decision. Many observers thought Nuncio may have been the best. Third in the final, a half-length back after traveling three wide without cover all the way, Nuncio was nothing short of heroic. In the final, Royal Fighter got locked in the pocket and had a lot more to give, as did BBS Sugarlight, second on the outside, locked by Nuncio not giving in, three wide. Maven got a perfect trip as third on the outside, coming three wide 750 meters to go, covered by Nuncio, but had no punch in the homestretch. While Magic Tonight also won his elimination, no newspaper had him as the early morning pick. The tip from most experts was BBS Sugarlight, who was supposed to lead all the way from post one. But Örjan Kihlström made a bold try with Magic Tonight from post five and surprised BBS Sugarlight. “Magic Tonight has a fantastic technique and he’s nice to drive,” Kihlström said after winning the elimination. Here, Maven raced as third on the outside, making an attack with 750 meters to go, coming three wide without cover, accelerated again in the last turn, passed French star Timoko, and fought outside Magic Tonight down the homstretch, defeated by half a length. “If she’d got one position ahead in the racing order, she might have won. I’m optimistic for the final,” said Jimmy Takter. BBS Sugarlight was locked in the pocket as third, while Timoko kept the pace and reached the final as fourth. The first elimination had a surprising winner in Per K Erikssons Royal Fighter, with driver Jennifer Tillman. Royal Fighter raced without cover all the way outside the leader Mosaique Face (third), defeated him and held attacking Nuncio (second) behind. Tillman was excited. “You have to ask Royal Fighter what’s happening. I can’t describe the feeling, and I won’t be able to, not even in ten years.” he said. This was the third time in the history of Elitloppet that a female driver raced. After the eliminations Nuncio was the only one that changed his equipment. In the final he raced with shoes only back. “I’m used to winning races like this. I’ll have to come back with better horses,” Jimmy Takter said, naming the the Hambletonian, the Prix d’Amerique and The Elitlopp as the three most important events in the world of trotting. In June there are two major races for international trotters in the north of Sweden, and then there’s The Oslo Grand Prix in Norway, June 14. “I have no idea what Mavens next race will be. 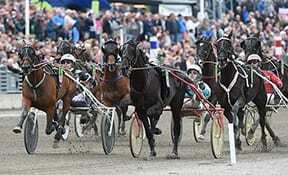 I have 14 days to decide,” said Takter. Creatine didn’t make it to The Elitlopp this year but he will race in The Jämtlands Stora Pris at Östersund racetrack in Sweden, June 6. There were 26,842 people on hand at Solvalla to see The Elitlopp this year. If they come back next year, they might see a 5-year old Nuncio as the winner of The Elitlopp 2016. Marvin Katz and Al Libfeld operate a breeding program with the tag line “the best is yet to come,” and it’s quickly moving in that direction. On Sunday, the Toronto-based horsemen celebrated a victory when Magic Tonight, a six-year-old trotter they bred by Andover Hall out of Miss Possessed and sold for $55,000, won the Elitloppet in Sweden. Less than 24 hours before, Katz and Libfeld saw another horse they bred, the talented three-year-old colt trotter French Laundry, place second in a $100,000 New Jersey Sire Stakes race at the Meadowlands won by stablemate Canepa Hanover in a blistering 1:51 1/5. Katz and Libfeld are among the partners that own French Laundry, by Muscles Yankee out of the Conway Hall daughter Creamy Mimi, who sold for $115,000 as a yearling at the Lexington Select Sale. Katz and Libfeld are among the partners that own Canepa Hanover, a half-brother of 2006 Horse of the Year Glidemaster, purchased as a yearling for $300,000. So it was an unbelievable 24 hours for Katz and Libfeld – an interesting trifecta of sorts as breeders, owners and sellers. Magic Tonight won eight of 28 races in North America, including the 2012 Pennysvania Sire Stakes championship, and $468,174 in earnings from age two to four and had a speed mark of 1:52 4/5. Owned by Adam Victor & Son and trained by Noel Daley, the horse was sold privately after his four-year-old season to Sweden’s Lennart Agren and given to trainer Roger Walmann. The horse became a star last year, setting a new speed mark of 1:51 3/5, and had a chance to race in the Elitloppet, but his connections declined. He kept improving this season, leading up to the Elitloppet, winning his heat and prevailing in the final by leading at every pole. The only downside for Katz and Libfeld is that they no longer own Miss Possessed. They sold her a few years ago in a semi-dispersal of 10 mares to cut down on their broodmare band. Katz and Libfeld have been in the standardbred game more than 45 years, but they have taken their own knowledge and combined it with strategies from trusted people to cultivate an overall winning operation in all facets of the sport. Last year, they started a website, www.libfeldkatz.com, to present a fully transparent overview of their breeding operation. It is kind of a playbook to help people understand their science and methodology, which is to essentially going by the axiom of breeding the best to the best and hoping for the best. The broodmare band they started out with strictly trotters has expanded to include pacers. They have access to two-time Pacer of the Year Captaintreacherous, in whom Katz was a partner, and current three-year-old sensation Artspeak, a champion last year in the two-year-old male pacer division. “My participation in Captaintreacherous just made it inevitable that we were going into the pacing broodmare business as well,” Katz said. “It’s just another extension of our breeding operation, or it made sense to not be as exclusive in trotting. To be a real participant in the breeding market, we felt diversity was an important part of it as well. Katz said he and Libfeld are still finalizing the exact number of yearlings they will offer in the Lexington Select Sale, but emphasized all of their colts will be for sale and the majority of the fillies, too. Katz said the volume of what he and Libfeld are doing is with the intent of becoming comparable to industry giant Brittany Farms. Katz and Libfeld credited the team of individuals involved in all aspects of their operation for the program’s success. The collaborative effort includes bloodstock agent Perry Soderberg and Jimmy Glass, whose late father, Bart, was instrumental in helping Katz and Libfeld select yearlings and broodmares, and trainers Jimmy Takter, Tony Alagna and Julie Miller. “It’s a team effort, without question,” he said. “We’re very excited about the new relationship with Bob Brady, manager of Kentuckiana Farms. Last fall we changed the format of how we were approaching this and Bob Brady took over the breeding side of it and raising the foals and so forth, and I think that’s going to have a dramatic change in our mindset and will have a vast improvement in the product we are able to produce in the future.